This isn’t one of those Wine Country restaurants that you read a lot about. In all of my weeks and months of research I never once heard of it. We would never have even noticed it perched on the left side of the road on Rt 12 as you head out of Sonoma. 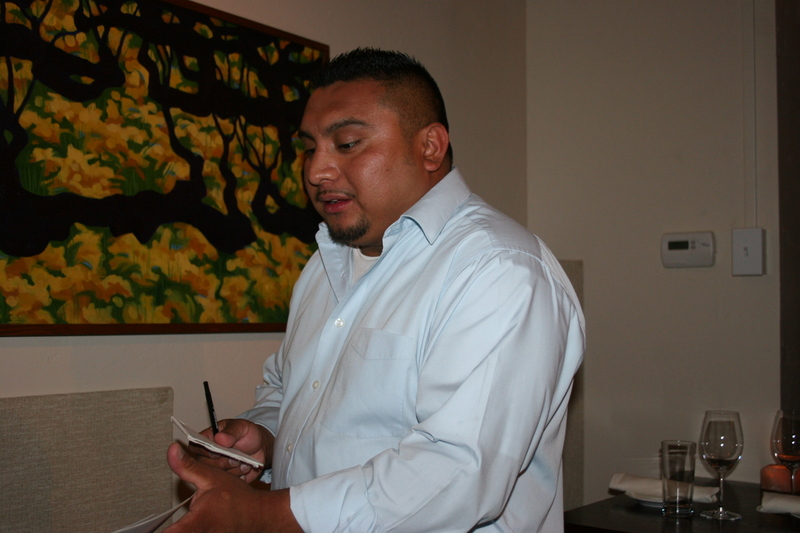 We were there on Wednesday evening only because it was recommended to us by Chef Max Porter-Elliott at the Mayo Family Winery Reserve Tasting Room. Thank you, Max, good choice!! 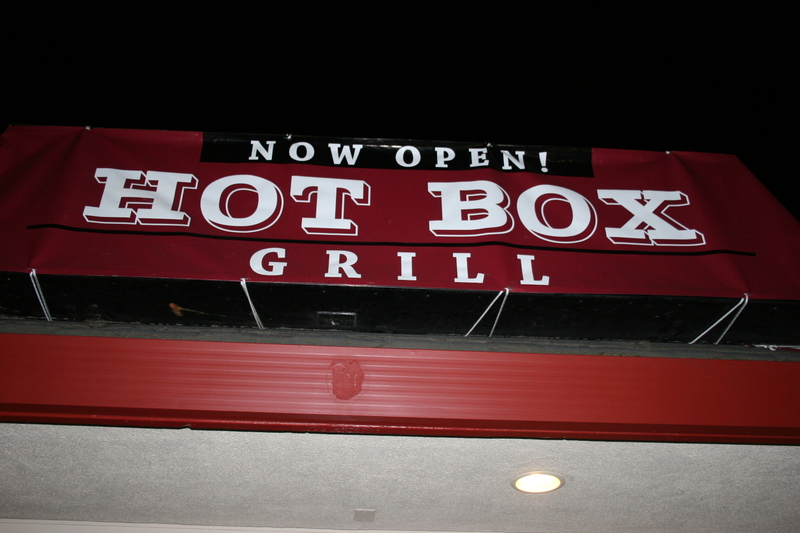 Let me start by saying that The Hot Box Grill is small. I’d say it seats maybe 30 or 35 people. We made a reservation for 8:00 P.M. but our table still wasn’t open so we sat outside for a while and were offered a complimentary glass of wine. 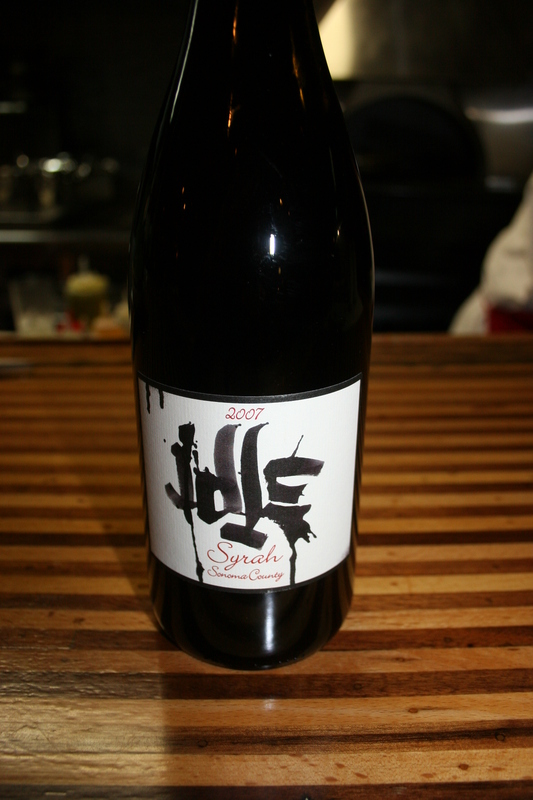 I had a glass of something I had never heard of, the 2006 Idle Cellars, “Laddie’s Vineyard”, Syrah. This one was produced a mile or two up the road in Sonoma. It was full flavored and delicious with peppery notes of dark spices and deep black berries. This was a good start, a wine I had never heard of at a dining spot I had never heard of, either. We had pretty much decided to make this a “no wine” night so, having finished my complimentary Syrah, I moved to one of the local sodas while others went with beers. I remember Joe B. had a Scrimshaw Pilsner from North Coast Brewing Company. We started off, as usual, with appetizers and there was a lot to choose from on the menu. 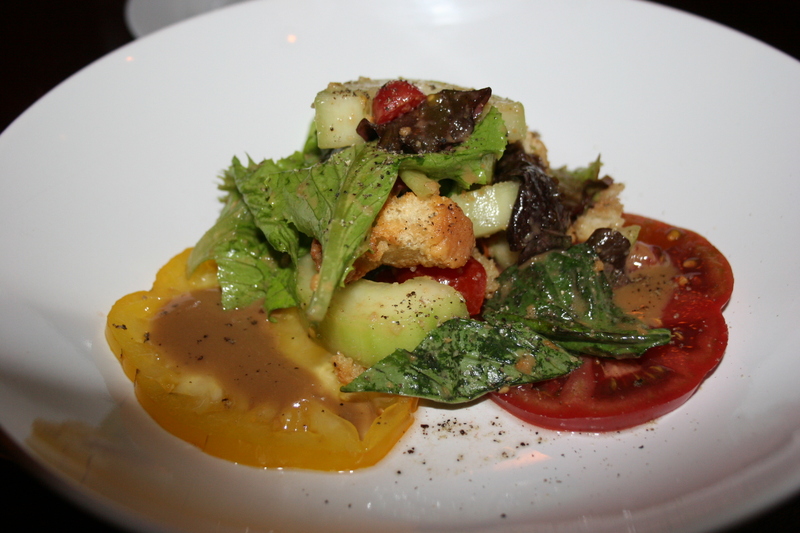 Jerry and Joe had the Heirloom Tomato Salad, I think this made the third straight night for local tomatoes so I guess Joe thought the California version was on a par with New Jersey. 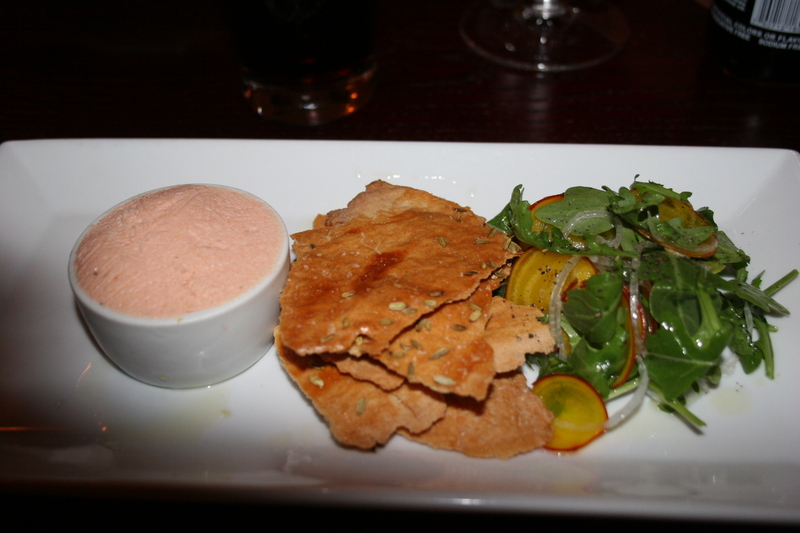 Joann had a very interesting Trout Mousse with home-made fennel crackers. 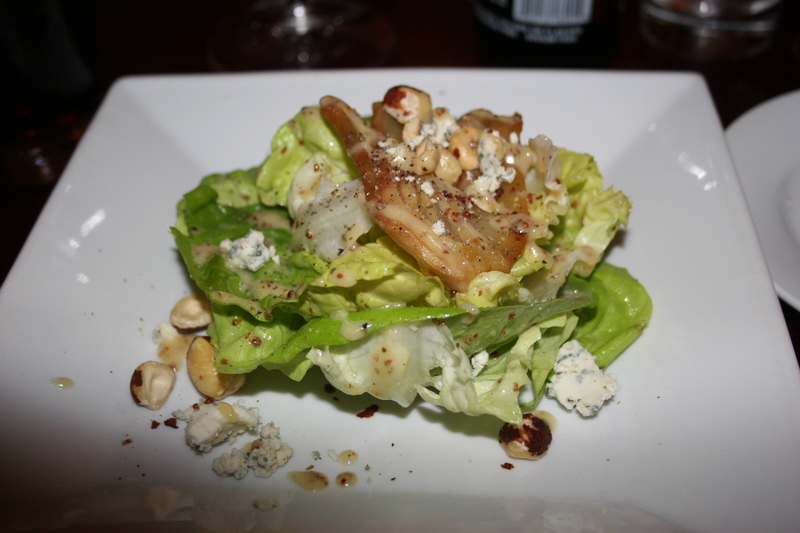 Carol, Kathy and I had the Pear salad, with Point Reyes Blue Cheese, hazelnuts and whole grain mustard vinaigrette. Everything was tasty and fresh and we were now looking forward to our main course. 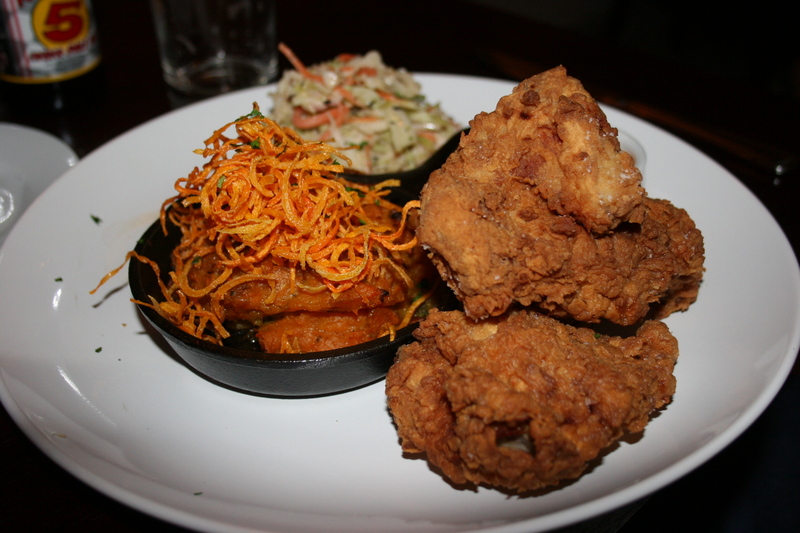 Jerry’s was an interesting choice, he ordered the Deep fried cornish game hen, sweet potato gratin, hot box hot sauce, Norm’s cole slaw. He really enjoyed his meal. The hen was prepared nicely with a crisp coating and the sauce was just right for the dish. Kathy had one of the night’s “specials” the Orichetta and Cheese, the tiny little pasta swirls were cooked to perfection and the tangy cheese was excellent. 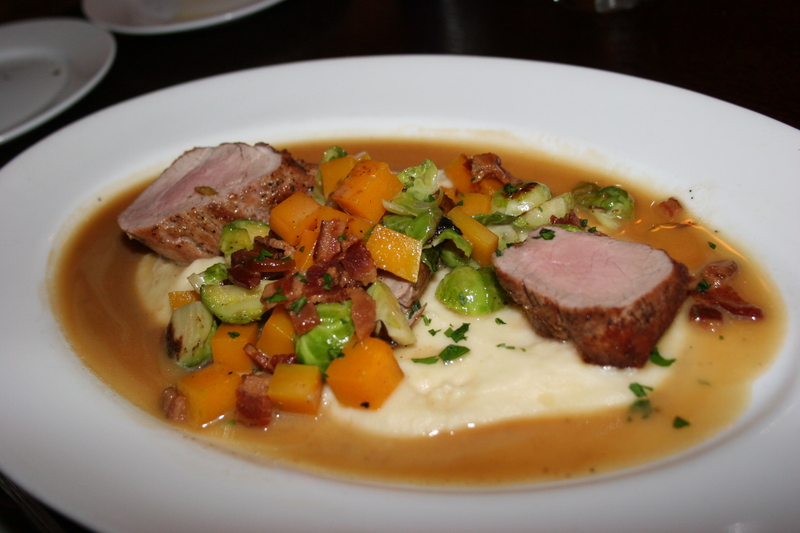 Carol and Joe B. both went with the Seared pork tenderloin, apple/bacon pan sauce, celery root puree, butternut squash, brussel sprouts. Like just about everything else we ate this one was a first class effort. It’s obvious that Chef Norman Owens, the original chef at the wildly popular Cafe LaHaye in Sonoma is on his way toward another winning food mecca. 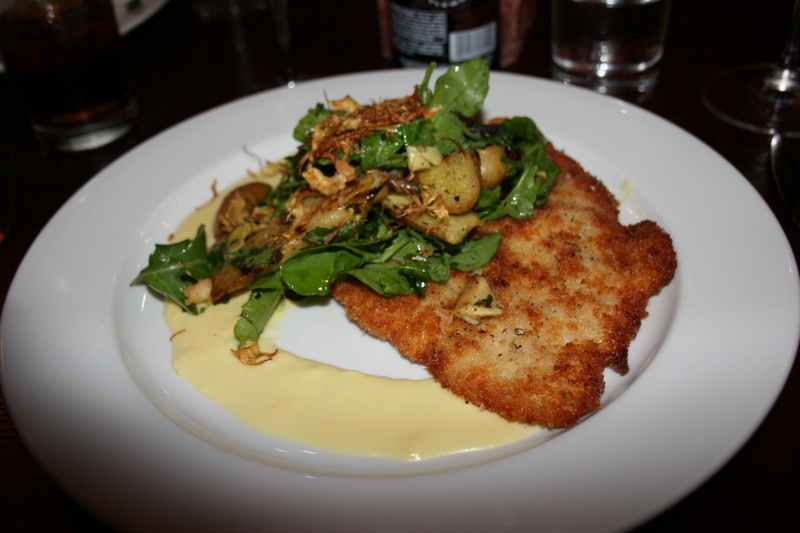 JoAnn had the Crispy chicken paillard, arugula, fingerling potatoes, baby artichoke, sweet onion soubisse. The sauce looked wonderful and the little noises of satisfaction which I heard coming from her direction was evidence enough that she liked the dish. I thought about the chicken, I wanted the chicken, I ordered the Grilled spice rubbed hanger steak, duck fat fries, béarnaise sauce, seasonal veggies. 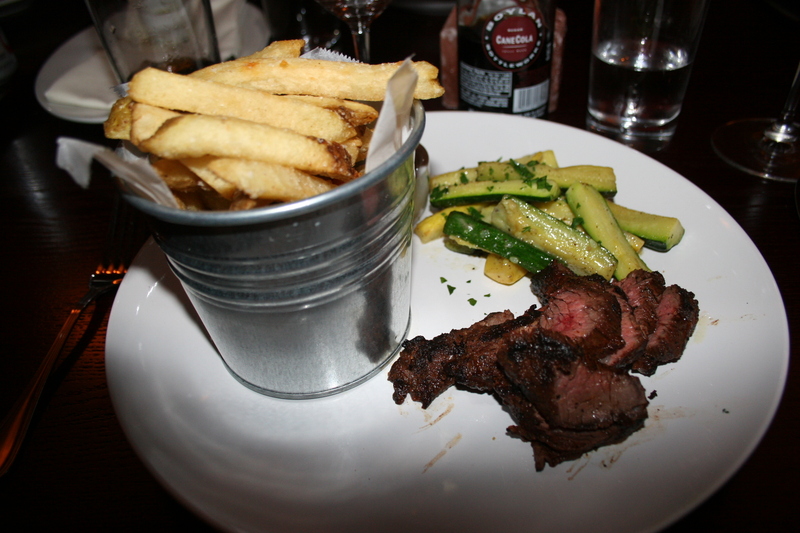 The veggies were fine, the hanger steak was very good, the duck fat fries were DEEEEEEEEELICIOUS! Finally, fries with substance and flavor on the west coast. I have been looking for these all week. There is something to be said for expectations. 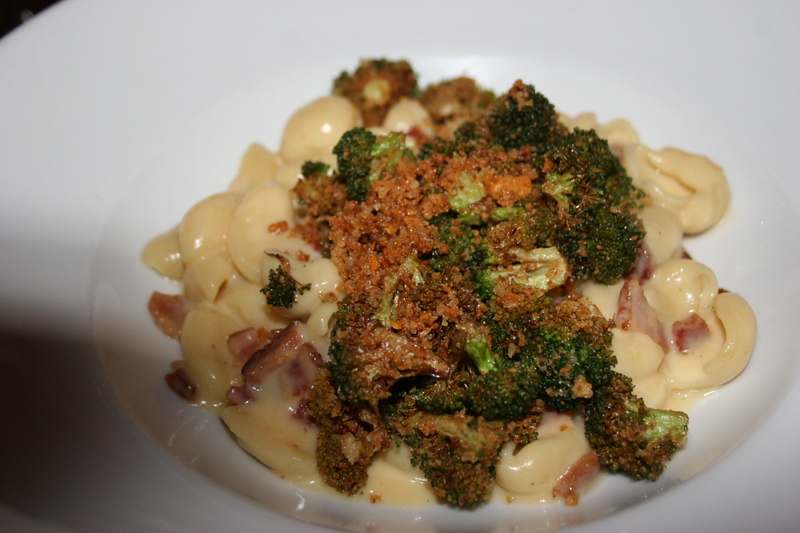 Last night, at Bottega, we had high expectations and were let down. Tonight, at this virtually nondescript little dining spot, we expected little and were highly impressed. We evn decided to have dessert. 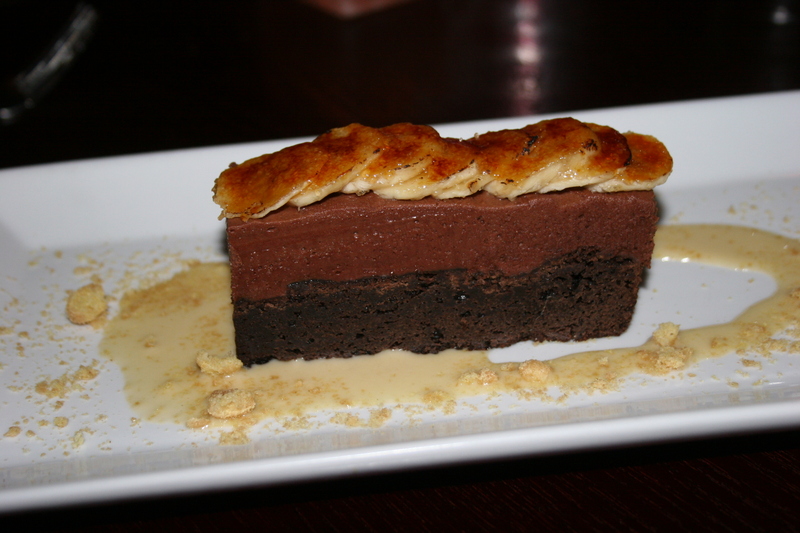 On the right is the Chocolate Mousse Banana Cake. 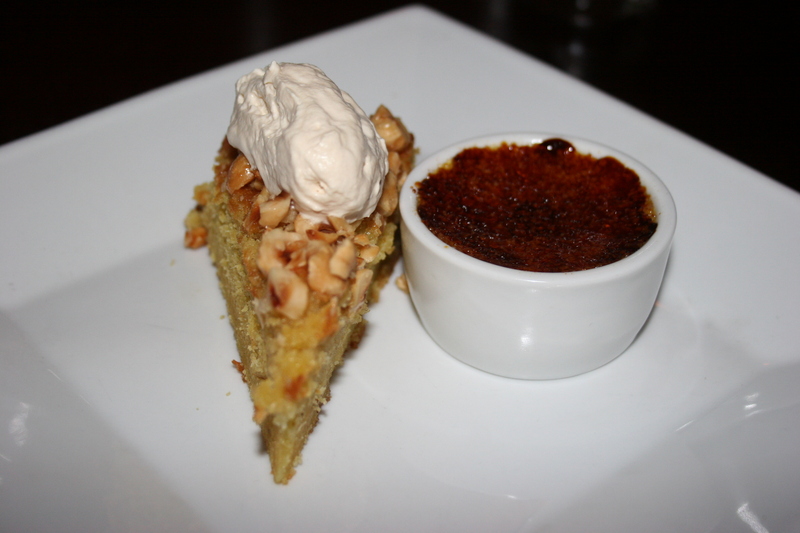 We had a bunch of forks and together we made quick work of both of these yummy sweet morsels. We came away from the Hot Box Grill with our hunger satiated and full of the good vibes generated by this soon to be discovered Sonoma restaurant.